Have you ever explored the possibilities of making a homemade instrument with a pencil? A Brand New pretty wooden pencil has so much potential other than writing. Exploring the options for sound making with a common object is an excellent exercise in creativity for young minds. It is this kind of out-of-the-box thinking that develops problem solving skills, and with the right approach, such as a lot of open ended quesitons, can extend to higher level critcal thinking skills that will prepare your child to tackle the many changes they will face in the future. And to think, this can start with a pencil, and a desire to create a variety of sounds. This can even be enjoyed by children around 1 years old with your full focus and guidance. Family Challenge to design and create unique instruments with one or more pencils. It has become a tradition for each Kindermusik student from 12 months old up to 7 years old to have the opportunity to choose a colorful pencil for Valentine’s Day . They, and their family, are challenged to make an instrument, of any sort, using this pencil (leaving it UNsharpened). A few examples are demonstrated, and most of the students leave the classroom explaining their creative ideas in detail to their parents. They are so excited to be given this project. Since 2008, my Kindermusik students and families continually surprised me with their creativity. This slideshow brings back such great memories of each of these children and the families that opened the door to let their creativity flow – in their own unique way. 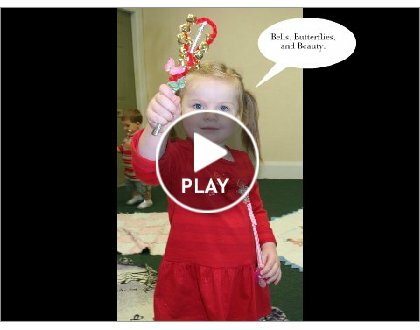 Watching the slide show with your child may jump start their creativity by seeing so many examples. I suggest watching it together, and making a list of all the different types of things that were used. Putting a wide variety of ideas in writing, even if the child cannot read, supports the real world USE and importance of writing down our ideas… so we remember them all, even if we only choose to use a few of them. Pencil Percussion: How the pencil is being used? (tap or rub…) How many are used? Or is there something attached to it for shaking? Creation method: How are things attached (rubber bands, tape, glue…), and are there decorations that don’t add to the sound? This is an excellent way for a child to see the importance of words on paper, leading to an interest in literacy. It also can be helpful in setting them up for success in letting their creativity flow. Read over the lists, talk about what you have around the house, and gather several options from each category. Lay them all out on a table – easy to see and reach. At this point, you may just sit back and relax, and OBSERVE your child as they enjoy the process of creating something truly their own. Describe the objects and what they are doing, but don’t judge. Ask them what they think about it. What is your favorite thing on this table? How can we use it to make a sound that you will like? What do we need to do to put it all together? How would you like to decorate it? Really observing and describing their actions and choices without judgement helps them recognize that you value their efforts each step along the way, building their confidence as independent thinkers, and DOers. Let them ask you for help if they need it, or if they seem frustrated, offer 2 – 3 different options to resolve the next step. Do they want to make more than one? Would they like to see something that the parent may create separately? Their answers may surprise you. Once completed, put on the upbeat tunes and have a parade. Call Grandma and let them share their enthusiasm about the new instrument – letting them tell the story to describe how they made it. (Here is a great opportunity to see how much they listened to your descriptions of them, and how much they use their own words to describe what they did.) This is EXCELLENT for language skills, and eventually make much better writers! I suggest video taping everything in that last paragraph ! Then share with as many people who will listen in front of the child. The child will be so proud, reinforcing ALL of the learning that went into this creative process. If your child is too young to describe it, then have them play the instrument for a family member, then point to the different parts as YOU describe in detail how the child created this special instrument. In their minds, it’s as if they are doing the whole thing themselves, AND it helps make connections as they listen to the description so they can point to the correct part, and gain that vocabulary that will be used in the future. I look forward to seeing what our children and families will create this year. Perhaps I’ll make a new slide show with the results ! If you DO enjoy this activity, we’d love to hear about your creative ideas. How did YOU and your child make an instrument using a pencil? If you recieved a color changing Kindermusik pencil at a recent local Cookie Concert, EXCELLENT. Perhaps you will take the challenge to make it into an instrument. We’d love to have you Schedule a Visit, and bring your Pencil Instrument to share your creativity… and you will have a great time making music with us, as well as being able to choose a scarf, or a red egg shaker to take home. If you were able to explore sounds with us at a local Lakeland event, such as the ISO Cookie Concert, you may have also enjoyed the TIMBRE eggs. Plastic eggs were filled with different objects to create a variety of sounds. Children are invited to shake them and see if they can find a matching SOUND. Older children are challenged to find ONE of EACH FOUR sounds. You are likely to have plastic eggs around this season, and there are SO many more uses than just your traditional egg hunt. One of these ideas is making TIMBRE eggs. This article discusses what TIMBRE is, why it is important for our children to explore, and a variety of ways to explore this concept, developing audio discrimination skills… specific to all ages starting in infancy. Interested in creating other homemade instruments? You may be inspired by these ideas, and adorable pictures of my previous students and their creations. Oh, how this makes me miss them.